This flavor is enriched with a smooth cream and a hint of coffee and mascarpone cheese.The softness of this rich dark flavor blends in so easily. 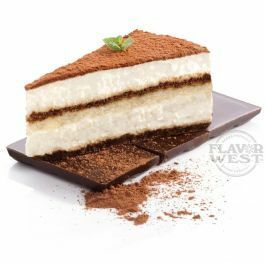 Type: Tiramisu Water soluble Flavoring. Usage Rate: 15-20% Ingredients: Natural and Artificial Flavoring, Propylene Glycol and Ethanol. Flavor suitability: Food, baking, beverages, whipped cream, frosting, butter cream and so much more. Specific Gravity: 1.00 No Refunds on Flavoring.